How to draw Guo Jing 郭靖 from Legend of Condor Heroes 射雕英雄传, a wuxia novel. Learn to draw Guo Jing 郭靖 in portrait simple illustration style from step by step with instruction. In this tutorial, you will learn to draw Guo Jing with simple shading to get the simple portrait drawing result. 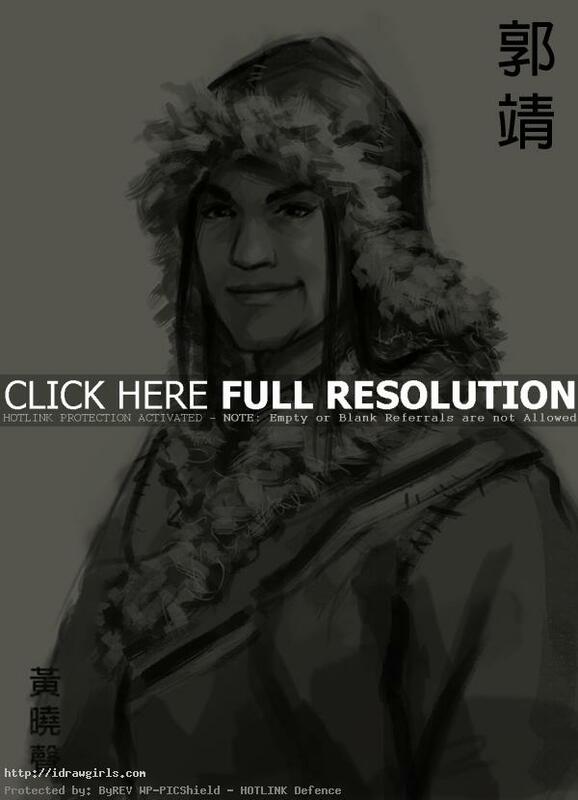 You will learn to draw facial structure or portrait along with his Mongol outfit. Guo Jing is a main protagonist or hero from a Legend of Condor Heroes, a novel, by Jin Yong 金庸 (Dr. Louis Cha) and the first part of the Condor Trilogy. He is not the brightest man, but he is one of the kindest and most loyal friend you will ever meet. I also stand for moral and justice. This drawing took me about twenty to twenty-five minutes for the demo tutorial purpose. It is not a finished illustration by any means. First, I usually start drawing simple geometry shapes to established base or her facial structure. To achieve accurate proportion and likeness of the character, you have to notice the placement or location an the actual shape of eyebrows, eyes, nose, and mouth. Do not think to much of trying to draw a face, but think of them in term of shapes and form. It is important to get correct shape, proportion, and placement in the initial sketch first. Remember to observe the face carefully then keep portrait simple and keep the foundation accurate before you drawing on top of it. Legend of Condor Heroes novel 射雕英雄传, a Wuxia novel, is a Chinese style fantasy novel. Guo Jing is the main character of The Legend of the Condor Heroes and a supporting character in the second part of the Condor Trilogy, The Return of the Condor Heroes. He is the only child of Guo Xiaotian and Li Ping, the husband of Huang Rong and father to Guo Fu, Guo Xiang, and Guo Polu. Guo Jing is described as having thick eyebrows and large eyes, of sturdy and strong stature, and a complexion that is somewhere between dark and fair. Frequently described as dumb, slow, and inarticulate, Guo Jing is the complete opposite of his clever and witty wife, Huang Rong. His most distinguishing characteristic, apart from mental slowness, is his constant fight for moral rectitude. In the Legend of the Condor Heroes, he was a simple boy raised in Mongolia, who considered personal loyalty to be the highest virtues, that gradually learned the importance of the sworn word and eventually compassion and the nature of violence. Here is a final drawing of Guo Jing. 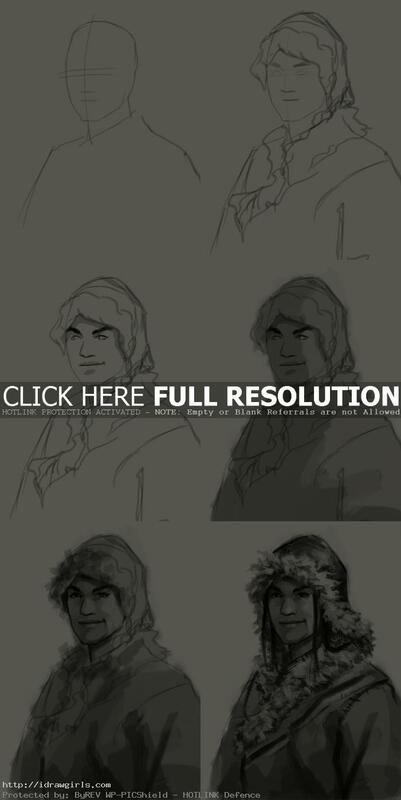 Below are step by step how to draw Guo Jing. Step one, I started off with simple head shape, then using guideline to establish eyes, nose and mouth placement. Step two, I drew his Mongol style hat and thick fur coat along with hint of facial structure. Step three, I then start to draw his eyes, nose and mouth with thicker lines. You can just stop at this step if you just want a line drawing. Step four, I use medium gray to paint all of his figure and face. Step five, I then painted in some basic shadow and light. Step six, I finalize the drawing using black accent along with rough brush strokes. Yeah~! Jin Yong is like a Tolkien in Asia, he created a perfect fantasy-historical world! I’ve read every masterpiece from him. My parents are also great fans of his works. Ah… I don’t know the english title exactly…笑傲江湖 2001 is my pick. It’s very good to talk about Jin Yong with someone on the other side of the earth. LOL, thanks. I’ve read all of his novels. And I watch all the series growing up as a Chinese kid with my family. My most fav series is 2003 from mainland China production, it blew me away. Yang Guo is his nephew yes. My favorite of all would be Wei Xiaobao (韋小寶) . Wow, I didn’t expect this character here… but he is one of my favorite character! Master Jin Yong’s novels are also very famous in Korea. I also love Guo Jing’s nephew… I don’t know how to pronounce in chinese… Yang Guo of something? Anyway, great job. Love you!